You’re in your senior year and you either haven’t been on Spring Break yet or your past attempts at being a breaker have been nothing more than a trip to the cottage with a few of your friends and a pack of beer. 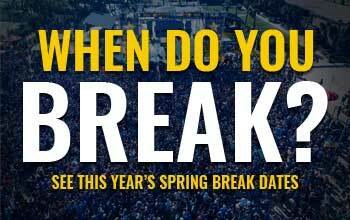 In other words, you have one last chance to experience a true Spring Break. Go to Panama City Beach, Florida. The mecca of Spring Break has also been given the worldly title of “Spring Break Capital of the World” and is travelled to by not just Americans, but by others from various continents eager to experience what this amazing place has to offer. So, if you’re going to do Spring Break right, start with the best destination. Go to the Beach Bash Music Fest. This daytime beach event is the biggest event on Spring Break. Top national acts perform on the beach’s largest stage and you won’t be disappointed with what you see, hear, or experience. Get the VIP package and you’ll be treated like royalty with your own stage platform, bar, and entrance gate. A must-go-to event. Get a Panamaniac Club Card. If there’s one thing you should do this Spring Break, it’s get this card. It’s literally designed to save you money and guarantees that you’ll be partying with thousands of fellow breakers each and every day and night at the biggest and best clubs on the beach. Daytime events, nighttime events, a free souvenir Spring Break T-Shirt, and VIP treatment. What more could one ask for? The Beach. Don’t just hit the beach. Soak every last minute of it in. There’s a reason why this place is nicknamed the “World’s Most Beautiful Beaches”. It’s absolutely breathtaking, spanning 27 miles of pure white, sugar sand beaches. Your sunset beach walks will never be the same after. Seriously, you’ll think you’ve died and gone to Heaven. The Food. You may be on a tight budget, and that’s understandable. But with all the money you’ll save by getting the Panamaniac Club Card, you can afford at least one nice night out to one of many of Panama City Beach’s premiere restaurants. Savor the fresh seafood, and really experience the southern hospitality. You need to treat yourself, especially if this is your last Spring Break. So why not do it in style.